Saute chicken pieces, shallot, garlic and red chili pepper flakes for 6-8 minutes. Add asparagus and cook 3 minutes more. Whisk together the liquid aminos and honey. Add to skillet and cook another couple minutes. This looks delicious! I love asparagus. Thanks for sharing with SYC. 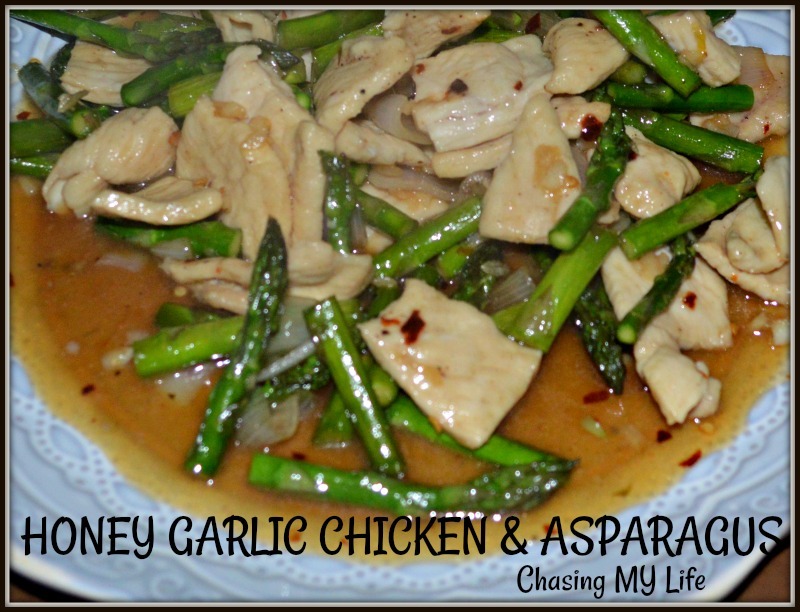 I have some fresh asparagus from the garden so I am going to make this dish today! Hope you are having a great weekend and thanks so much for sharing your great post with us at Full Plate Thursday! I hope you really enjoy it. It has become one of our favorites for a light dish. For some reason I only like asparagus when it is fixed with something like chicken. This looks delicious. Found you on Blogger’s Pit Stop Link Party.